Just put out a study this morning with my colleagues from PSI screening a number of biological fungicides. These materials have been accumulating interest on the part of both growers and buyers as they seem to fit a more "natural" approach to food production attractive to consumers. Trouble is, and I've had conversations concerning this with my colleague Gerald Holmes down south at CalPoly , that it's hard to get treatment separation in field fungicide screens for Botrytis. And much less for biological materials which tend to be of a lower efficacy. Time to go all in to try and tease those treatment separations to come out. As (I hope) most of our industry participants know, Botrytis does not generally infect the mature fruit, and rather infects the open flower and lies dormant until the fruit reaches a certain ideal concentration of soluble solids. With that in mind, I'm thinking it's a good call to start these screens, especially of less established materials, early in the year when most of the early crop is still in the flower stage, and with the addition of these intermittent, late season rains we have the table set for a very solid piece of work. Along with the weekly applications of fungicides, we'll be doing both in field evaluations of marketable and diseased fruit, and then take it even further with clinical evaluations in the lab once we have mature fruit. I'm very optimistic here that we'll really bring something of value forward on Botrytis this year in strawberry. The scene in the field this morning right before the rain. Plenty of open flowers, ready to receive spores of Botrytis. 8001 TJet Nozzle from a gang of 10. Brand new ceramic, Teflon tape and brass fittings. Doing high quality work and loving it! For those of you who might have missed it, the presentations of last week's UCCE - CalPoly Strawberry Center are posted here. Just speaking for the Watsonville event, we had a seriously large SRO crowd that read like a who's who of the industry with lots of enthusiasm with plenty of participation. Just a side note here, but a good number of people commented to me later on that they really got something out of this single topic format. I hear you loud and clear, and going forward to will look to do more of these. 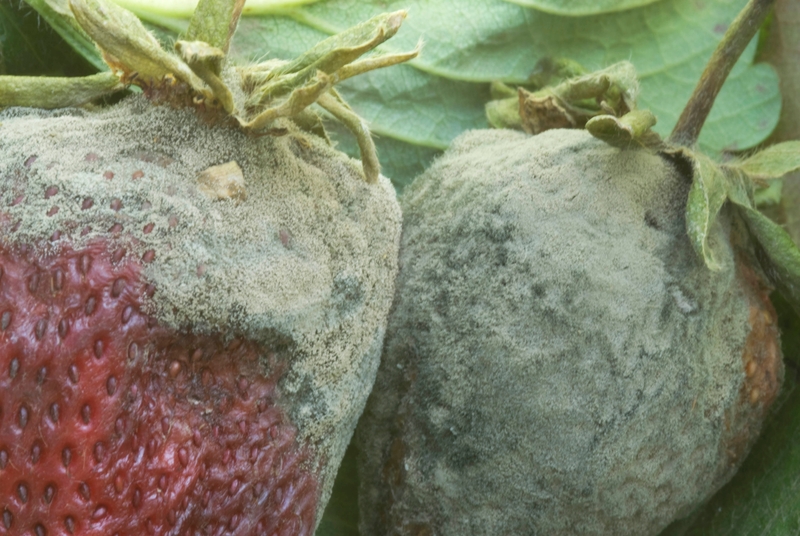 Very nice set of guidelines for Botrytis fruit rot in strawberry that Steve Koike and I wrote up as an expansion of a blog post we wrote a few years ago. Thanks to Joy Jacobs of the California Strawberry Commission, we now have them available for you in a beautiful full color format. Download, print, use as you wish, this is the latest word in Botrytis management for berry growers. Summary: In 2014, the authors evaluated fungicide products against a slate of several registered fungicides and an untreated control. Fungicides were tested for efficacy against gray mold caused by Botrytis cinerea and powdery mildew caused by Podosphaera aphanis. Introduction: The authors have been engaged in studying fruit and foliar pathogens in strawberry since 2007. 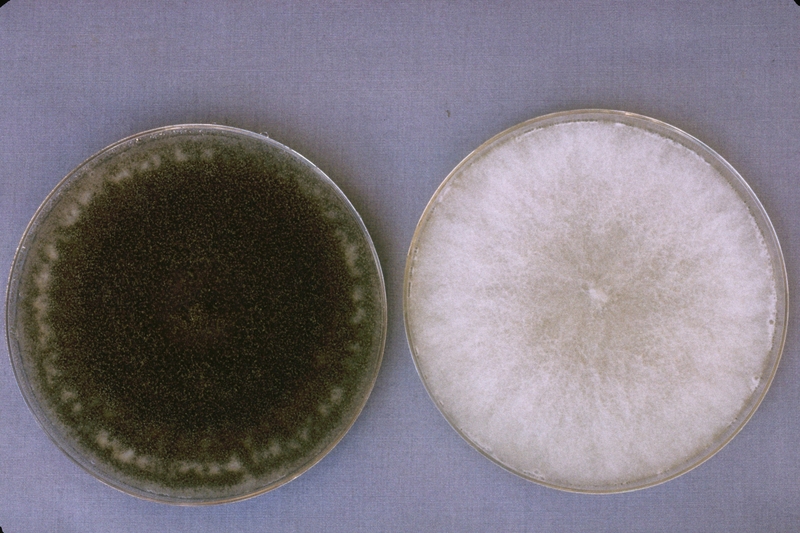 While this group of pathogens includes anthracnose caused by species of Colletotrichum, leather rot caused by Phytophthora cactorum and angular leaf spot caused by Xanthomonas fragariae, the fungicide screening of 2014 concentrated on the two most common problems: gray mold caused by Botrytis cinerea, and powdery mildew caused by Podosphaera aphanis. Year after year these diseases are the most important foliar/fruit concerns for growers, and subsequently garner the most attention from fungicide distributors and manufacturers. Powdery Mildew: The trial consisted of treatments (Table 1) arranged in a randomized complete block design with each treatment replicated four times, on the Holly Ranch managed by Dole on the variety Monterey. Applications of all materials were made in the equivalent of 150 gallons per acre with a motorized backpack sprayer and hand held boom configured with ten 8001 flat fan nozzles operating at 120 psi, which is intended to closely mimic the conditions of commercial application. Applications of all materials were made two weeks apart: May 16, May 28, June 16, and June 24, 2014. 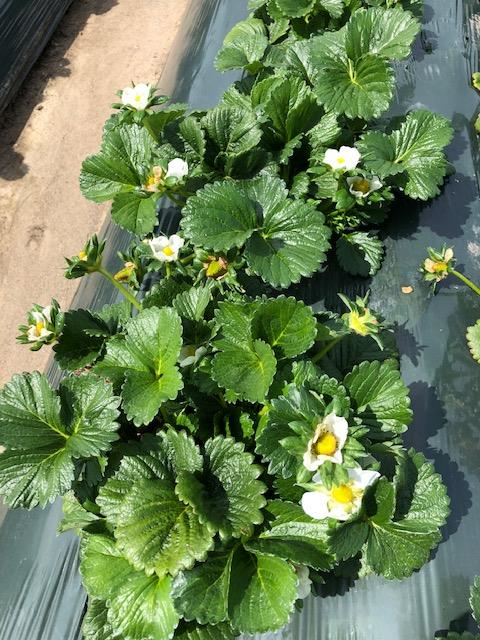 Powdery mildew evaluations were done on June 5, June 19 and July 7 and consisted of taking ten strawberry leaflets (per plot) of young to mid-age and assigning a percentage on a scale of 0-100% (in 10% increments) to the level of powdery mildew severity on the underside. Botrytis Gray Mold: The trial consisted of treatments (Table 3) arranged in a randomized complete block design with each treatment replicated four times, on the Holly Ranch managed by Dole on the variety Monterey. Applications of all materials were made in the equivalent of 150 gallons per acre with a motorized backpack sprayer and hand held boom configured with ten 8001 flat fan nozzles operating at 120 psi, which is intended to closely mimic the conditions of commercial application. Applications of all materials were made two weeks apart May 16, May 28, June 16, and June 24, 2014. Evaluations for Botrytis infected fruit were made during the weekly fruit harvest by a professional crew of research plot harvesters beginning May 21 and continuing until July 16. Culls were sorted and examined for symptoms and signs of gray mold disease, and a percentage of gray mold infected fruit was calculated from the total fruit harvested from that plot. Data results (Table 4) is presented as a percentage of Botrytis infected fruit from the total amount harvested. Powdery Mildew: Control of powdery mildew by both rates of Merivon and a rotation of Torino and Mettle was exceptional, with percentages of infection significantly lower than many treatments in each of the three evaluation dates. Looking at the last rating date on July 7, neither formulation of Thiram controlled powdery mildew, but the inclusion of Procure together with Thiram 24/7 did result in disease percentages below the untreated control. Test compounds isofetamid and pyriofenone had lower percentages of mildew than the untreated control. Rally 40W did not have significantly lower percentages of mildew than the untreated control. Botrytis: With the exception of the June 18 evaluation date, no significant differences were found between any of treatments. On June 18, both treatments of Merivon demonstrated lower levels of Botrytis infected fruit than the untreated control, Thiram 24/7, isofetamid @10.3 fl oz + IB8111 and Pristine. Final Note: The use of fungicides, including unregistered materials, is the topic of this article. Before using any of these products, check with your local Agricultural Commissioner's Office and consult product labels for current status of product registration, restrictions, and use information. We thank Patty Ayala, Kat Kammeijer and Monise Sheehan for their assistance with this trial. We acknowledge the California Strawberry Commission and cooperating companies, in particular Dole, for supporting this work. Introduction: A major purpose of this blog is to educate and inform on new emerging issues and developments in strawberries and caneberries. In addition, we also want to review and update common, well known issues that readers may be very familiar with. 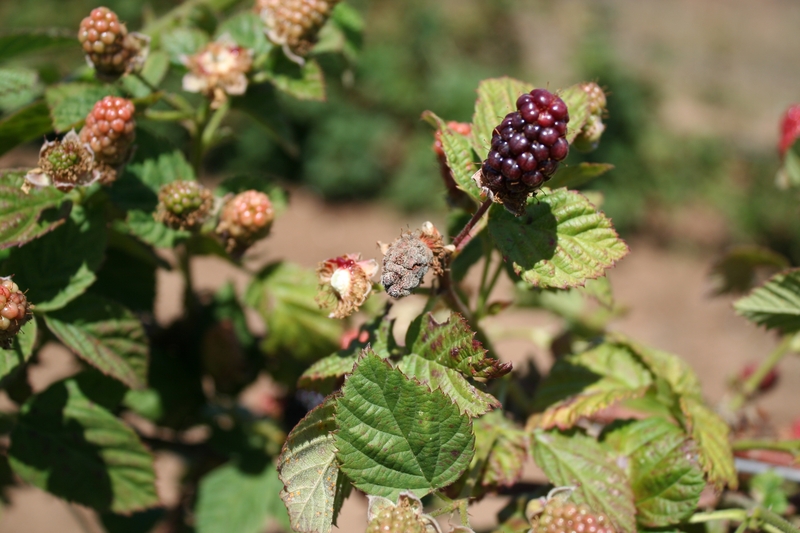 The following article is a review of a very important disease affecting the strawberry and caneberry industries: gray mold caused by Botrytis cinerea. Causal Organism: Botrytis cinerea belongs to the fungal phylum Deuteromycota (sometimes also known as fungi imperfecti) and reproduces by forming asexual spores (conidia). The sexually reproducing stage has not been seen on strawberry or caneberry. The young mycelium of this fungus is septate, branched, and basically colorless. When this fungus is grown on potato dextrose agar, a common medium used to culture fungi, Botrytis cinerea is at first white and later turns gray as spores form. The spore producing structures are branched, up to 5 mm tall, and light to dark gray in color. 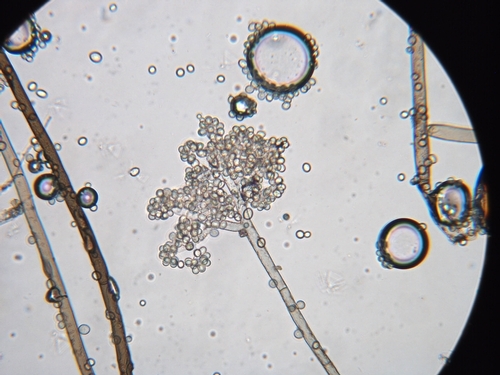 Even under the low magnification of a dissecting microscope, one can readily see the distinctive “botryose” (Greek for bunch of grapes) clusters of spores at the ends of the spore-bearing branches (see sixth picture below). 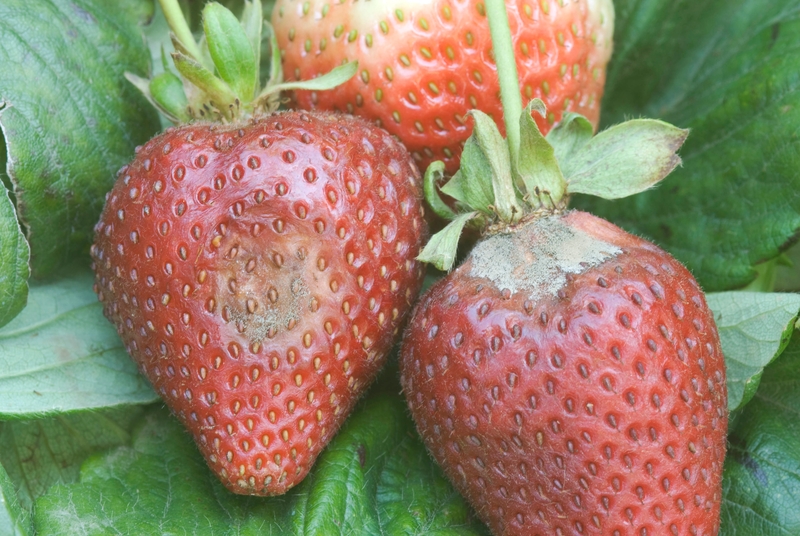 Symptoms on Fruit: The rot from Botrytis is fairly simple to distinguish from the other fruit rots occurring in strawberries and caneberries. Generally, Botrytis rot will start as a light brown to gray spot (see third photo below) without any distinct margin around the affected area. This spot remains firm as it spreads and even a fruit completely rotten with Botrytis will retain its original shape. After a few days, if conditions are favorable (temperatures between 59o- 77oF), a brown to gray velvety growth will appear on the surface of the infected fruit. Disease Cycle: Botrytis fruit infections on the Central Coast generally begin when the spore lands on the strawberry or caneberry flower. Given cooler temperatures and the presence of water, the spore germinates and infects the flower. If conditions are really favorable, the disease will progress in flower tissues and result in blighted blossoms that will no longer develop into fruit. Partial flower infections can cause brown lesions to form on the fruit receptacle; such flowers will not produce normal, fully developed fruit. 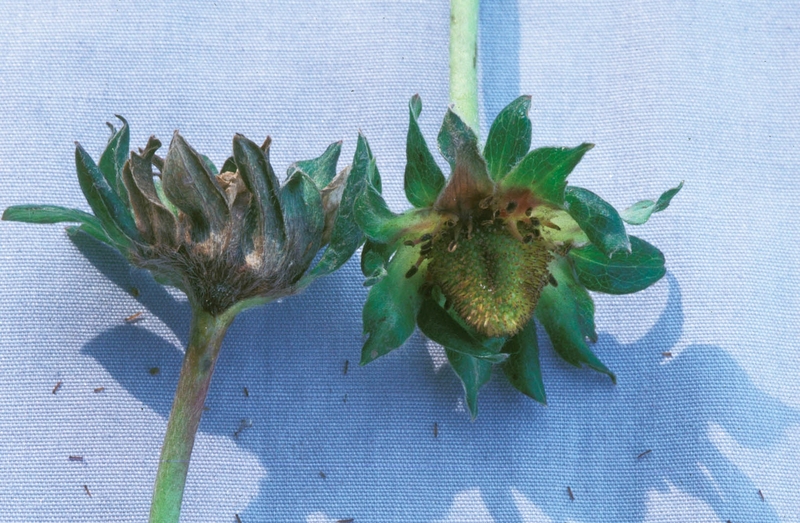 In other cases the flower-invading Botrytis can become dormant and will not resume growing until fruit sugar content is more amenable for growth, at which point the disease will become evident from the brown lesion and subsequent gray velvety growth that occurs on the ripening fruit. If conditions become unfavorable for further disease development, Botrytis growth will stop and the lesion will become dry and leathery. Because Botrytis is an aggressive colonizer of plant wounds, direct infection of the fruit can also occur if the fruit is injured from physical abrasion (rubbing caused by winds, for example), insect feeding, environmental extremes, other diseases, and other factors. Mature, ripe fruit are especially susceptible to infection because of their high sugar content and sensitive tissues. For this reason, Botrytis is an important component of post-harvest fruit losses. Epidemiology: Botrytis spores (primary inoculum) are everywhere. The fungus grows well on senescent, dead tissues (old, dead strawberry stems and leaves; crop residues of other adjacent crops). Spores are blown by winds or splashed by rains onto flower and fruit tissues. It is important to note that the presence of free moisture for several consecutive hours is necessary for spore germination. Therefore, development of gray mold disease is greatest in cool and wet conditions, such as rain and the fog commonly experienced here on the Central Coast. Control: Growers and managers should take a threefold approach to managing Botrytis gray mold in the field. Fungicides: There is a substantial universe of fungicides available for the management of gray mold in strawberries and caneberries and a decent listing of these materials is available at the UC IPM website (http://www.ipm.ucdavis.edu/PMG/crops-agriculture.html). The key point for disease managers is to apply fungicides BEFORE major moisture events. As emphasized above, Botrytis spores need free moisture to germinate; therefore fungicides, which mostly act as protectants,should be in place before the occurrence of humidity and free moisture from rain or heavy fog . It is worth noting that the use of surfactants, which serve to better distribute fungicides over the plant surface as well as stabilize them, is strongly recommended with fungicide applications. Sanitation: Removal of infected fruit from around the plant during the harvest season is helpful in reducing Botrytis gray mold potential, since each infected fruit produces millions of spores that can move onto nearby flowers and fruit. It is not necessary to remove fruit completely from the field; deposition of diseased fruit into the furrow and its periodic destruction by foot or machine traffic is sufficient. Additionally, removal of dead leaves on occasion can be of benefit because it removes another potential source of inoculum while at the same time maintaining more air circulation around the plant and keeping it drier. Moisture management: Knowing that free moisture is critical to development of Botrytis grey mold gives managers a key tool in limiting development of this disease. For strawberries, planting so as to account for expected plant size and allowing for more air circulation is one step. It is worth noting that transplants can be chilled with an eye to managing plant size; short day varieties such as Chandler and Camarosa should not be chilled more than three days for most situations, and day neutral varieties such as Albion, San Andreas or Monterey generally should not be chilled more than 18 days. 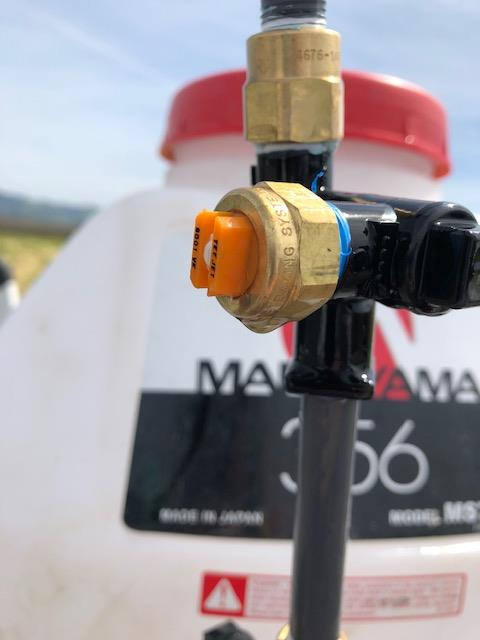 The use of drip irrigation, a universal practice in California, is essential for preventing irrigation water from contributing to favorable conditions for gray mold disease. The use of macro-tunnels (also called high tunnels or Spanish tunnels) in caneberries results in a tremendous reduction of free moisture from rain or dew and a very real drop in the amount of gray mold disease to the extent that fungicide applications for Botrytis might be dispensed with entirely. There is no bigger step a caneberry grower can take to reduce Botrytis gray mold in their crop than to construct a macro-tunnel over it. Before using any fungicide products, check with your local Agricultural Commissioner's Office and consult product labels for current status of product registration, restrictions, and use information. Gray mold lesions on calyces of developing fruit. Photo courtesy Steven Koike, UCCE. Early gray mold lesion on strawberry fruit. Photo courtesy Steven Koike, UCCE. Extensive Botrytis sporulation on advanced gray mold of strawberry fruit. Photo courtesy Steven Koike, UCCE. Botrytis infection on blackberry fruit. Fruit is desiccated and dried out. Photo Mark Bolda, UCCE Santa Cruz County. Clustered spores of Botrytis cinerea. Photo courtesy Steven Koike, UCCE.